Austin, Texas — Accompanied by Republican Party of Texas leaders, Republican businessman Quico Canseco this week officially filed to be a candidate in the Republican Primary for the 23rd Congressional District of Texas. 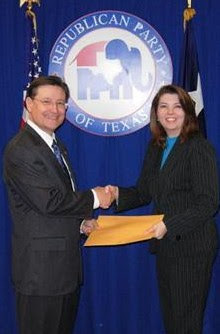 Canseco filed the documents necessary to officially place his name on the March 2008 Republican Primary ballot at the state headquarters of the Republican Party of Texas in Austin . Canseco has been campaigning since early 2007 in the race to unseat Democrat incumbent Ciro Rodriguez. Canseco was joined by Texas Republican Party Chair Tina Benkiser, an Party of Texas GOP Executive Director Talmadge Heflin and Texas GOP Victory 2008 Chair, former Secretary of State Rodger Williams. “It was an honor to be joined by our state’s Republican leadership as I made my candidacy official,” said Canseco. “Though I have been campaigning for over a year now, I am happy to have reached the point in this race where my place on the Republican ballot is official. I am committed to winning this race, defeating the Democrat incumbent, and restoring conservative leadership to the people of South Texas ,” said Canseco as he filed the required documents with Benkiser and Heflin. In addition to serving on the board of the Texas Federation of Republican Women, Quico Canseco also serves as the Republican Party of Texas’ Associate General Counsel. “As I have campaigned for the 23rd District, I have listened to the concerns of grassroots Texans. I want to carry the hopes and aspirations of the people of South Texas to the halls of the United States Congress and represent the values of faith, family, and freedom which are the foundation of our American way of life—the same values that have made our state and nation strong,” said Canseco. Texas Republican leaders are excited about Canseco's candidacy and believe that he offers the party its best opportunity to retake the 23rd Congressional District next year. Ann Peden, Medina County Republican Party Chair noted "We are very fortunate to have someone with Quico Canseco’s business background and experience as well as exceptional education and people skills running for Congress. His qualifications coupled with his reputation for hard work, integrity, and practical approaches to problem solving make him uniquely qualified to represent the citizens of District 23." Thousands of GOP leaders and grassroots voters from South Texas and across Texas are supporting Canseco in his race for the Congress and his campaign has consistently been touted by officials with the National Republican Congressional Committee( NRCC), the campaign arm for Congressional Republicans, as offering the GOP its best opportunity to regain the 23rd District, a major component of the party’s attempt to regain their majority in the United States House of Representatives.